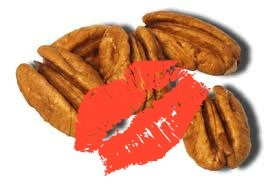 I have a new crush on pecans. Almonds, you’re like, so yesterday. Pecans, you have stolen my heart and I will be eating you with everything, on everything, and in everything within the foreseeable future. How have I rejected this nut for so many years? Minus the once a year pecan pie, pecans were off my radar. Not anymore. Let’s have food affair together, okay pecans? 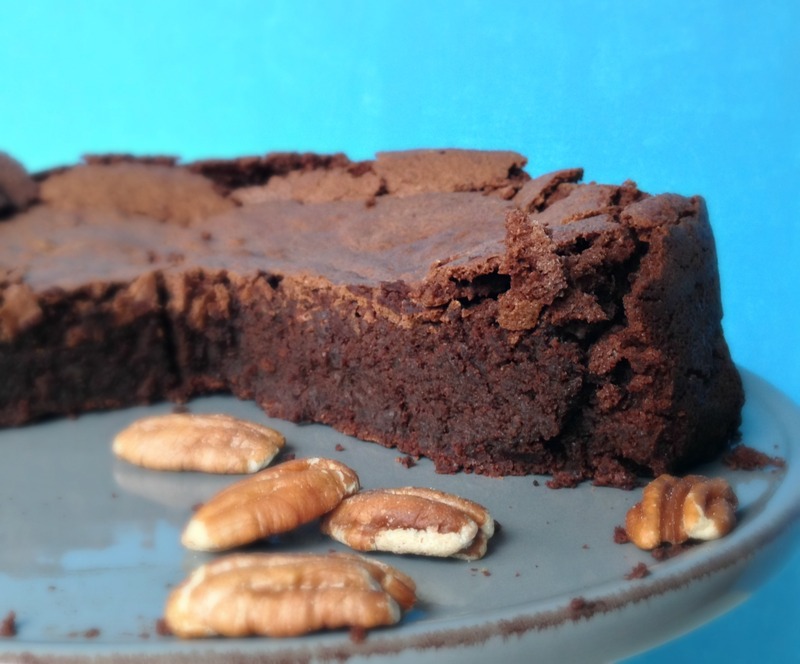 So, you can just imagine my excitement when I came across a recipe for a flour-less chocolate pecan cake the other day. Awww yeah! It was destiny, and I had to make it mine, all mine. This is a special occasion cake. It’s not a bake-sale cake or a one-bowl cake. It requires some luxury time in your kitchen. 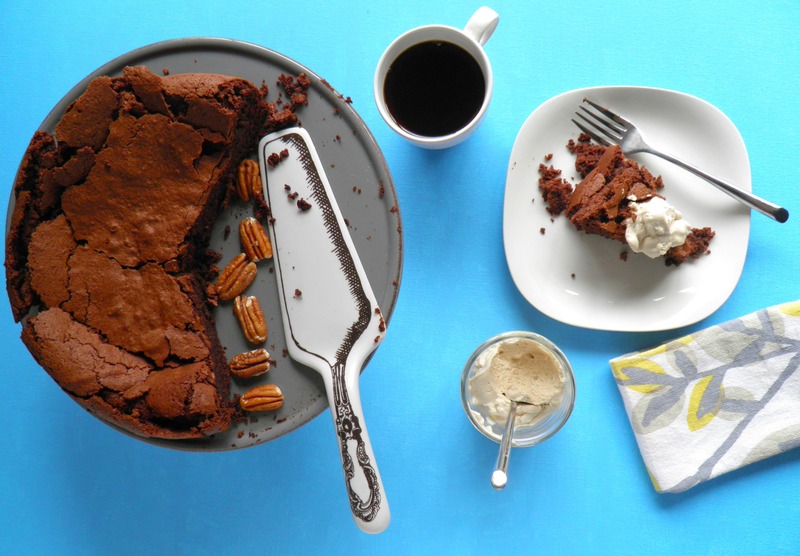 Just you, some pecans, chocolate, butter, and some sultry music. You’re going to be melting, whipping, folding, and licking (the spatula people!). And it’s worth it. May I suggest listening to Zou Bisou Bisou while making your cake? Eating this cake in bed is also highly recommended. Bon appetit! Preheat your oven to 325 degrees. Grease a 9 inch springform pan, and line the bottom with a circle of parchment paper, traced from the bottom of the pan. Melt the chocolate and butter in a heat-proof bowl over a pot of simmering water. When everything is melted and silky smooth, set aside and let cool slightly. In a small bowl, dissolve the instant espresso in the 2 tbsp water. In a large bowl (I mean large- I had to move everything to a larger bowl while making this cake), combine the egg yolks, vanilla seeds or vanilla extract, 1/2 cup of brown sugar, the espresso, the melted chocolate, the pecans, and the salt. In a stand mixer, or using handheld beaters, whisk the egg whites until soft peaks form. Gradually add 1/2 cup brown sugar, and continue to beat until the egg whites are glossy and stiff (hehe). Fold the egg whites into the chocolate mixture in two batches. Use a plastic spatula to do this. Be gentle and loving so you don’t deflate your egg whites. Pour the batter into your pan and bake for one hour. This is where the licking (spatula) comes into play. 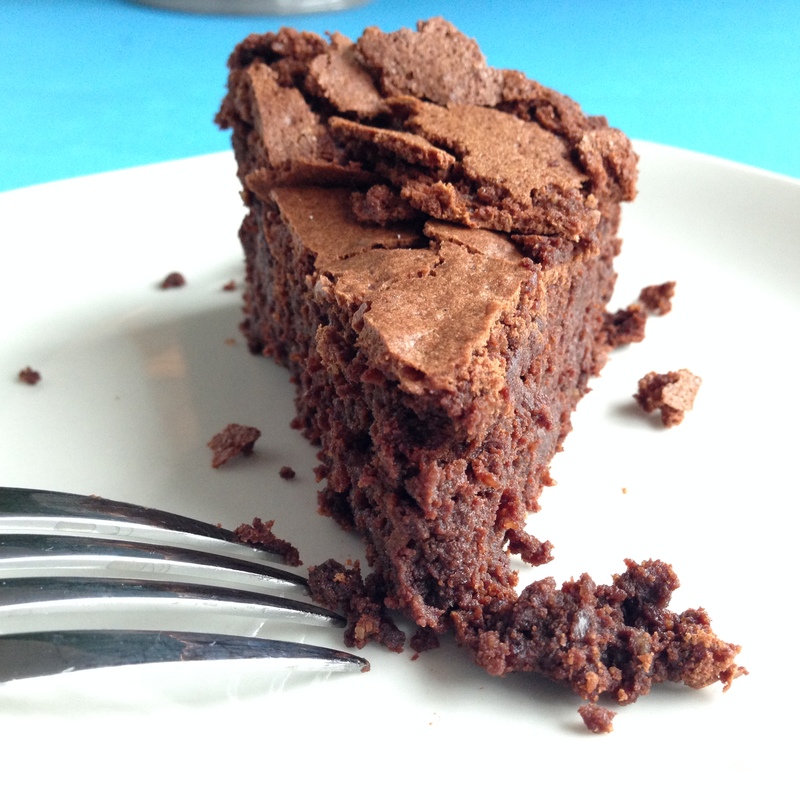 The top of the cake will be crispy and crackled, and the inside will be almost truffle-like. Oh yes. Cool the cake completely while still in the pan. To make the coffee whipped cream, beat the cream, vanilla, and instant espresso. Slowly add the confectioners sugar. Beat until you have soft peaks. Taste for sweetness. Remember, the cake is going to be sweet, so you don’t necessarily want the whipped cream too sugary. * To toast the pecans, heat your oven to 350 degrees and bake for 7 minutes. Let the pecans cool completely before grinding. 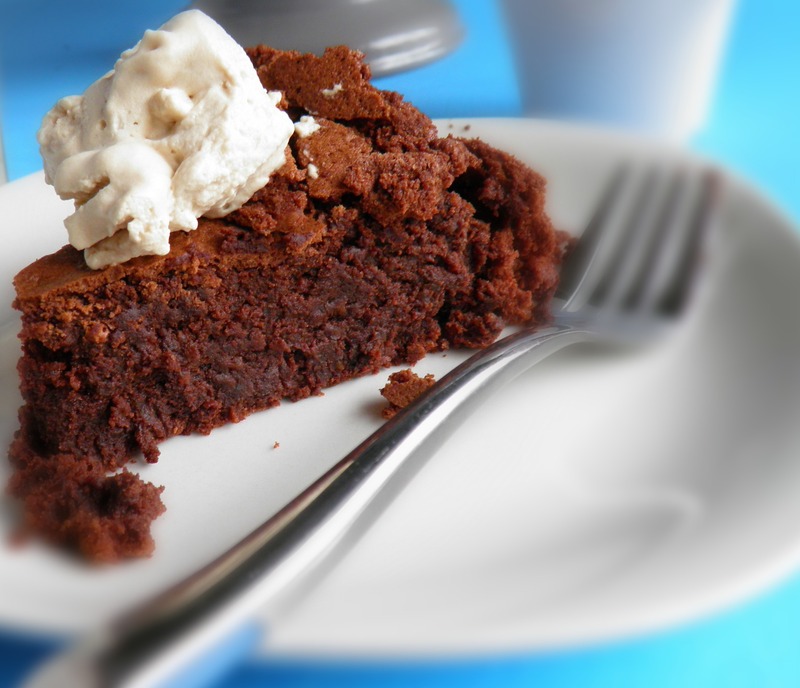 Serve the cake with a dollop of whipped cream and a strong espresso. Dim the lights, send the kids to bed, close your eyes, and enjoy. Was lucky enough to eat this at Anne’s home last night! You cannot even begin to imagine how delectable it was…she is the best chef EVER!! !